A gassy baby is an unhappy baby. A baby’s young digestive system is very prone to gas, especially when they’re being fed formula. Even though formula tends to give gas more than milk, there are actually some formulas that are designed to be easier on the digestive system and reduce gas, and they can make a huge difference. It’s important to note that gas is normal. However, there’s such a thing as abnormal gas, and it should probably be obvious that your child is suffering from it. Telltale signs include having a hard tummy, being fussy, crying and burping or farting. If your baby suffers from gas, you’re probably desperate to find a solution. I’ll go over the best and most-recommended formulas for fighting gas, and the pros and cons of each. Why Does Formula Make Babies Gassy? Some babies have a sensitivity to certain formulas, which can lead to side-effects like diarrhea and gas. Most formulas are based on cow’s milk, so if your baby is sensitive to it, they’ll end up with an upset tummy every time you feed them. You can read my guide on figuring out whether your baby is allergies to their formula here. The typical solution to this is to switch to a soy-based formula, which usually helps most gassy babies. The best thing you can do is talk to your pediatrician if you think your choice in formula might be causing your baby to have gas, and they’ll probably recommend you switch to one that has no lactose. It’s possible that it’s not the formula at all that’s causing your baby to be gassy. Sucking quickly from a standard bottle means taking in a lot of air from the bubbles in the formula, but there are actually bottles that are meant for gassy babies. They have venting systems to remove the air while your baby feeds so they don’t swallow any of it, greatly reducing gas. Before you jump to any conclusions and switch to an expensive baby formula, you might consider switching your bottle; it might make all the difference. Click here to see our guide on bottles designed to fight gas. Here are some formulas that can reduce gas and hopefully make it a thing of the past. 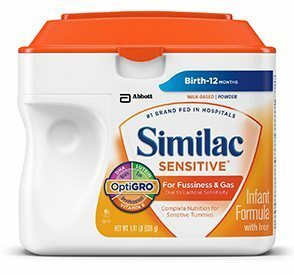 Starting off the list is Similac Sensitive (click here to check price on Amazon) which gets recommended a lot for parents of gassy babies, especially from moms who have been there. This is a milk-based formula but contains no lactose, making it much easier for babies to digest without resorting to soybean-based formula. A lot of moms praise this as a miracle formula, because it works really well for most babies that suffer from gas. It’s also formulated with a special type of carbohydrate that is supposed to reduce gas. 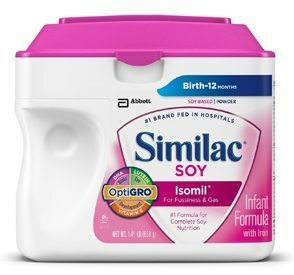 For babies that have a definite sensitivity to milk-based formula, Similac Soy Isomil (click here to check price on Amazon) is a great alternative. As the name would suggest, it’s completely soy-based as opposed to cow’s milk-based. If Similac Sensitive doesn’t help reduce gas, this might just be what you need. 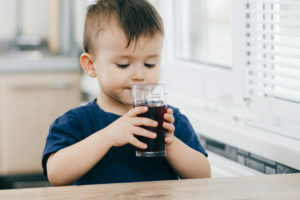 Before you switch to a soy-based formula you’re going to want to talk to your pediatrician first, as it’s not a decisions you should take lightly, and there are a lot of things you should consider before doing so. 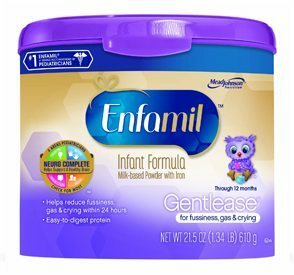 An alternative to Similac that a lot of moms swear by, Enfamil Gentlease (click here to check price on Amazon) is formulated to reduce gas. It’s a reduced-lactose milk-based formula, with 1/5th of the lactose of regular formula. While this isn’t as little as Similac Sensitive, it’s still a lot less and just might do the trick. In the end, this is more or less the same as Similac Sensitive. If your baby doesn’t agree with it, you could try this instead before switching to a soy-based formula. 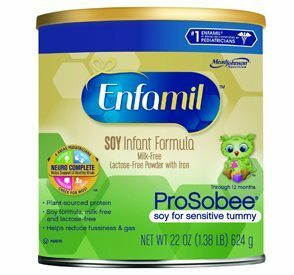 For the infant that can’t tolerate lactose at all, Enfamil Prosobee (click here to check price on Amazon) is the soy-based alternative. There is some debate over which soy-based formula is better, Similac or Enfamil. In my opinion, they’re about the same, but some children do better with one than the other. If you baby can’t seem to handle other soy-based formulas, you could give this one a shot. I’d recommend going with Similac before this, however. 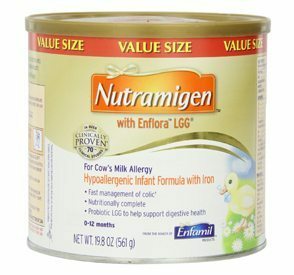 Another formula to consider is Nutramigen with Enflora LGG (click here to check price on Amazon). It’s formulated without sucrose, which is a sugar that some babies have trouble digesting. This formula is supposed to be good for infants who have trouble with both cow’s milk and soy milk formulas, and has very good ratings across the board. The main complaint parents have with this formula is that it smells… well… bad. But then again, what formula smells good? You do get over the smell after about a week, and baby won’t mind. It’s a great step to take if your child can’t seem to handle the other formulas on the list. There are a few other things you can do when feeding your baby to help reduce gas. When mixing the formula, be sure to do it in a separate container and then pour it into the bottle for feeding. This will reduce the amount of air in the bottle, and in turn, hopefully reduce gas. When feeding, make sure their head stays upright, above their tummy. This way, the formula sinks to the bottom of the tummy and the air to the top, which in turn makes it easier to burp out. Burp your baby after every feeding. If you find that she won’t burp, just lay her down for a few minutes and try again. You can also try something like Little Remedies gas relief drops (click here to check price on Amazon). You just add a few drops to these to every bottle, and it helps reduce the bubbles and gassiness. These often help a lot, especially when all of the other solutions don’t. It’s definitely worth a try, especially if you don’t want to switch formulas right away. Also, sometimes all you need to do is change your bottles! There are bottles that have vent systems to reduce bubbles, and in return, gas. You can read my guide on baby bottles that fight gas right here. Thanks for guidance. Helpful article. It is not necessary to sterile infants bottles as long as the water supply is safe. Gail, I’m sorry but I have to disagree. Sterilizing isn’t even so much about the water, but for keeping them clean and safe after using them, from things like bacteria and such. This is great information. I am struggling with my LO who is 3months old and has silent reflux and on medication. We are having new problems with our evening feed where we fall asleep and wake up screaming. We are already on Gentlease but seem to be having fussiness and gas still. He has also kind of switched from the silent to having multiple spits ups through the day. But he is happy with those for the most part. Now trying to decide if we should try a new formula and which would be the best. This mommy gig is no joke! I am also having this same issue with my newborn.. Have you found any solutions for your little one? Mine has silent reflux and we also switched to Gentlease. He seems to have gotten worse. And spits up more than he did before. Also screams most all of the time while he is awake as if his belly is in a lot of pain.. I’m thinking of switching to Nutramigen, but he doesn’t appear to be lactose intolerant. Looking for all the help I can get now! Thanks! That’s a really good article. Though in my opinion, there’s nothing better than an organic formula free from GMO, antibiotics, hormones, preservatives etc, to prevent gassy babies. I am convinced that that the right product make it a lot easier for babies to digest the formula milk.